“Mexico has a national government initiative to create a national Open Government Data portal in http://datos.gob.mx. Only some of the bodies of government have published information. Moreover, many of the bodies of government publishing yours Open Government Data within their own corporate websites. 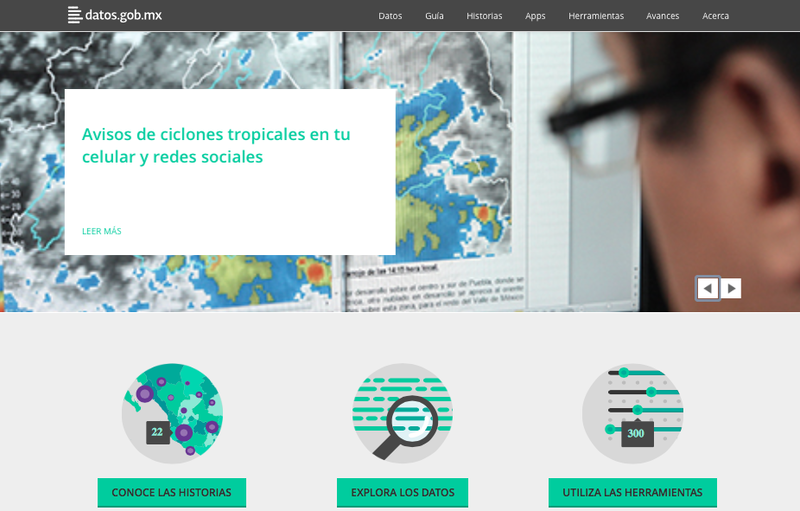 Datasets published in http://datos.gob.mx, there are 490 datasets from the federal government, state government, local government and autonomous agencies. They are also a few Webservices of national metrology service. This site also contains 43 applications. Lot of datasets are information for the offices was easy to open. Published data are mainly visualizations of information into geographic maps. Is very important develop applications that integrate different data sources, of government and the private sector, with the aim of obtaining new applications and citizens services. Moreover, published applications were developed by government agencies. Missing applications developed by citizens. The portal http://datos.gob.mx is a good initiative that comes from the government, but needs more applications and Open Govenrment datasets. Unfortunately citizen engagement is incipient, the initiative portal exposes government datasets but lack the dissemination and communication strategy, for citizens use the datasets and generates more applications. 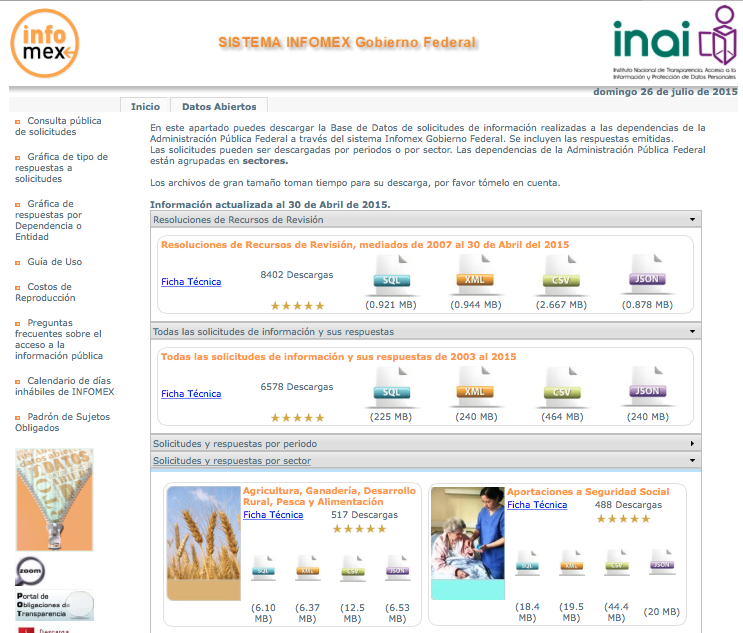 INAI is responsible for transparency in Mexico, INAI has published several Open Goverment Datasets. The datasets are located in open formats: SQL standard, XML, CSV and JSON. At 2014/31/12, this site had 3,611 visits and 30,009 downloads of datasets. “The system of Open Government Data (OGD) is evolving as a verifiable means of demanding transparency and accountability in governance. The civil society asks questions on their civil rights to be governed effectively and efficiently. This opens government books on budgetary incomes and expenditures, policy formulation and implementation in proportion to the yearnings and aspirations of citizens. Open Government Data is the irrevocable release and authorize use and reuse of public sector information by all, either through technology or otherwise. In this space, the data is processed from closed to shared and then open. The concept systemically adopts Open Data, Open Society, Open Knowledge and Open Participation. It provides knowledge on how government is being managed, what information is in the public domain and how the society uses the information to hold government accountable and/or promote good governance. The idea of open government has been embraced and implemented by many countries through policy formulations and transparency laws. The United States President, Barack Obama, introduces “Memorandum on Transparency and Open Government” which laid the foundation of good governance and citizen engagement in his administration. Nigeria is no difference, the country witnesses several calls and policy plans for open government and participation, of recent is the initiative of the Federal Ministry of Communication Technology in conjunction with World Bank and Department For International Development (DFID) to design a comprehensive deliverable action plan on open government to fight administrative corruption in the country, increase public accountability and integrity as well as innovation in public service bodies, civil society organizations and small business enterprises to better take advantage of increasingly available government data. This initiative encourages searching and retrieving government data freely, providing feedback and information sharing through a consultative and all-inclusive platform opening up high value datasets across ministries, departments and agencies. The Freedom of Information Act is an added and legislated document upholding open data in Nigeria, which can facilitate open government and end the shackle of good governance affected by impunity and corruption. Although the Open Data Development Initiative of the Federal Ministry of Communication Technology has taken the center stage, there is no veritable all-inclusive national portal for accessing government data. However, Nigeria has an offshore multilayered OGD portal launched by the African Development Bank (AfDB) for the purpose of improving knowledge and disseminating information about the country. Users can access, analyze and share datasets ranging from economic data, development indices and socio-political data. The portal also enables visualization and analytic info-graphic presentation of data to the end user. At State level, the government of Edo State has taken the lead in launching an Open Data Portal in 2013 to provide access to relevant, actionable and up-to-date State government data for use and reuse by civil society organizations, policy makers, business owners/investors, international organizations and researchers. The portal presents different datasets such as population data, environmental data, budget data, data on policy/project plans and implementation. These datasets are useful for business investors in making informed decisions to exploit opportunities for investment, and also for indigenes to engage the government on need responsive budget and projects. The emergence of social media and civil society organizations like BudgIT and Orodata to demand for transparency and accountability in governance using civic technology explores the virgin area of citizen engagement to hold politicians/leaders accountable for delivering on allocated funds for all sectors of development. Therefore, OGD and citizen engagement are indisputable platforms for consultations with government and civil society organizations spurring positive and desirable effects for society at policy and implementation levels. Open Data does not only enhance transparency, but creates jobs, culture shift, healthy democracy, economic development, good healthcare and is a secret weapon to uncover the dirt in governance. The impact of OGD can be maximized by involving all stakeholders and providing relevant and timely datasets with easy technological interface. However, despite the advantages of OGD, limitations and potential risks in national security, rights conflict and privacy data must be acknowledged. “There exist a range of arguments on how a society can fight poverty, widen investment opportunities for its people given scarcity of resources and move forward for a better future. This might be a function of what continent that a country is, which region in the continent or who its trading partners are. But these are only some of the external forcings that may define a development path for a country but are never sufficient to push forward a nation’s net wealth to levels where citizens can appreciate effort made by their governments in improving welfare of the otherwise pauper population. Internal organization and reorganisation is inevitable for a country that wants to double or triple its growth rate. This can be done by citizen engagement through their representatives, active civil society organisations and other lobby groups who can speak for the voiceless and point at mistakes that would have remained unresolved in absence of this input. Citizen participation in decision making is particularly crucial for development of any society. Literature indicates that countries that move forward invent and innovate in research and science and have their governments held responsible for decisions they make. Systems of governance in these countries are neither peculiar nor are these countries endowed with bountiful resources than others but leadership in place takes responsibility to ensure that there is equity and equality to all citizens. In these countries there is no person who is on her own when it comes to national development. That has been the secret. And the way to do it is through open data governance. “The Federal Democratic Republic of Ethiopia (FDRE) constitution guarantees freedom of expression, opinion and thought under article 29. The freedom of expression as recognized in the constitution consists of the right to seek, receive and impart information and ideas. Accordingly the public is at liberty to receive information about the working of the government representing them. By the same token, press and other mass media are entitled to gather information in the process of seeking ideas and disseminating them to the public. This means that the government is duty bound to be transparent and let its documents accessible to the press so long as it is for public interest. To achieve this end, The FDRE ministry of information and communication technology (then after named as ministry) is committed in expanding open data, and through which it tries to ensure the highest level of satisfaction, transparency and effectiveness in decision and policy making. For instance, the ministry has created the portal in which it disseminates open data, and through this portal the Stakeholders are also encouraged to participate in various channels such as opinion polls, discussion forums, and blogs and share their suggestions or feedback on matters of interest. The other point that is worth to mention here is e-Consultation. The ministry has a time of electronic consultation with its stakeholder. Often a time, the Consultation topics has been decided by the ministry, during which, stakeholders will be able to post their opinions and suggestions. At the end of the duration, the consulted topic will be archived, and the ministry will use the collected feedback from its stakeholders to help in policy making, decision making or piloting new opportunities. The other ministry in the country that uses portal to disseminate and receives information is the FDRE Ministry of Health. The Ministry’s portal is a two way platform through which both the ministry and stakeholder exchanged information. The portal is accessible and easy to use to all users. This portal is 100% compatible with Internet Explorer version 6.0 and above, and mostly compatible with Firefox, Netscape, Opera and major other web browsers. Through this portal, the ministry releases important data to the public, and open a chance to citizen to reuse the data, and forward their suggestion. “The concept of open data development is about making information and data freely available and searchable, encouraging feedback, information-sharing, and accountability. This is quite a revolution stirring in Nigerian environment and populace as a whole. We are particularly happy that the ministry of communication technology has taken all the necessary steps to protect the integrity of the initiative and ensure that open data fuels innovation and grows the Nigerian economy steadily. However this is inspired by the ministry of communication technology which kicks off one of its kind, the open data initiative development is to support the federal government achieves its objectives of investment, driving innovation of engaging citizens with its proceedings or activities or better still development as to open data and transparency to boost economic growth by enabling easy and quick access to raw open government data. This shows that the federal government is now truly open for business. The initiative is consultative and expected to give an inclusive process to open up highly valuable datasets across the countries government ministries to good people of Nigeria, the people of the world from all round the globe and to the valuable citizens ,business men and women both international and within for free accessibility of open government data. The Nigerian open data initiative, supported by the World Bank and DFID highlights the potential efficiency, innovations and public value that can be achieved when government uses technology to open data over 50 countries have launched federal-level open data initiatives. The commencement of the process makes Nigeria the world first federal open data initiative to simultaneously launch inclusive and continuing consultations with both government and non government communities on their open data priorities to develop the country’s national open data implementation plan. ” The philosophy of open data has been in existence since the 20th century. What is new is the interpretation given to the term open data. The increasing interdependence among economies, organizations, and human beings in general, has necessitated an upward linear trend in the need for and use of data. The increasing need for and use of data have demanded for more data access and openness. These have made open data a popular concept today. The proliferation of internet and social media has also helped in popularizing the concept. Open government data is about government making data (unclassified) accessible to the citizens for use, reuse and distribution for free without any restrictions. Open data has gained much attention in Nigeria in recent times. The importance of open data has become increasingly obvious in every aspect of life. Individuals have realized that with open data they can make informed decisions and engage strongly with the government. Private organizations have seen the significance of open data in helping them to save time and make smarter decisions. Civil society organizations know that with open data they can measure government’s performance and dialogue constructively with the government. Government has realized that the more accessible and open data becomes the more likely citizens are to understand and accept the government and share its values. The first indigenous open data portal in Nigeria was launched (at the state level) by Edo state government in September 2013. The portal gives access to reliable and timely data on Edo state government, international organizations and non-state actors, and provides user-friendly ways to find and reuse the datasets. The portal has become a unique platform for various users, including policy makers, researchers, analysts, business leaders, and investors to obtain data about the state government and its partnering organizations. Though the portal laudably provides public users with hands-on access to about 90 datasets (which include but not limited to budget data, geo-data, census data, fiscal data, and project implementation data) the portal is deficient in data for main macroeconomic and socioeconomic indicators, and data analysis technology within the portal, which suggests that users are unable to perform multi-dimensional queries on various datasets or perform comprehensive analysis; hence limiting full citizen engagement. As a new initiative that is already threading on a commendable path, there is no doubt that the data portal will improve over time. Prior to the launch of open data portal in Edo state, the African Development Bank (AFDB) had launched in March 2013 an open data portal for 20 African countries, including Nigeria, as part of its efforts in improving data management and dissemination in the continent. In the open data platform, Nigeria has its designated portal with user-friendly tool that enables users to extract data, create and share views as well as work with others, and visualize data across themes, sectors and countries. The portal provides access to a wide range of data, including but not limited to macroeconomic data, socio-economic data, and development data on Nigeria and other African countries from several international and national official sources. Users are enabled to visualize time series data over a period of time, perform comprehensive analysis, and make use of the ready-made presentation graphics. All these help to build an informed population of users and enhance citizen engagement. With these nascent developments in open data in Nigeria, the Federal government has chimed in with the launch of Open Data Development Initiatives to give citizens enabling access to government in order to drive innovation, investment and economic growth. Though it is not clear the kind of data this initiative will make available, but the intensity of the goal suggests a comprehensive and advice-giving process that will make available without restrictions high value datasets from across government ministries, departments and agencies to all Nigerians, businesses and the rest of the world for free. Learner’s Submission: Implementation of Government Online in Colombia and Experiences with Open Data. “In Colombia the Ministry of Information Technologies and Communications (www.mintic.gov.co) leads the process of the implementation strategy for online government institutions both at the national and territorial. In Colombia has built a ranking of these entities using an index which in turn is calculated by the sum of subindices of the few components that make online government strategy. Transversal elements: comprise users’ characterization activities, security policies, institutionalization of the strategy, implementation of a management system information technology, among others, that are common to the other components. Online information: Try to make available to users all the information found in the state and is useful to the public. In this component we find the publication activity of Open Government Data. Interaction Online: Includes activities to enable opportunities for exchange of information between public officials, organizations, citizens and businesses. Online Transaction: Here are the activities aimed at the implementation of procedures and services using electronic channels. Transformation: This component seeks interoperability using electronic media through departments of an entity and other entities, seek to minimize paperwork chains and improve administrative efficiency. Democracy online: The latter component seeks to enable opportunities for participation of citizens where they can be part of the decision-making of government and public policy making. In this component, the theme Open Innovation working in the government and in turn there reappears theme open data for generating innovative solutions. Each dataset is downloadable in csv or xls format, has the metadata tab and a space for comments and user requests for each set. Open Data Protocol (HTTP, Atom Publishing protocol and JSON). In the latter works everything about open innovation and open data. Previously identified strategic issues for the country as institutions sector and contribute information for decision-making on such issues. With these strategic issues identified sources of data relevant to the important issues of government and proceeds to make the process of legal analysis and subsequent publication. Other institutions, especially technical, technological and vocational training, are attentive to see the opportunities for use of these data through hackatons, application development within their academic programs and related research. Entities will be encouraged to plan sustainability strategy and increase citizen participation through exercises open innovation and open data sets. Institutions build baseline indicators to measure and assess the impact in the medium and long term. You are currently browsing the archives for the Open Government Data for Citizen Engagement category.